They come to your house to decontaminate your room. There is nothing else like it out there. The home is the most likely place you harbor these deadly infectious bugs. Check out SteriRoom. There is tons of research on this method. Very safe and no harmful residue. 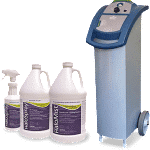 We are able to decrease the chance of infection by eliminating the majority of microbes that are in the room. Kills bacteria, viruses, fungus and mold. This system is better than regular hand cleaning and is more effective. Perfect for anyone who has been diagnosed with MRSA or C.diff. Great for any family who keeps getting viral infection or colds. Any patient with cancer or that is immune compromised. Peroneal Tendonitis Symptoms A snapping or clicking feeling of the tendon around the ankle bone….